Detectives Tuesday (July 17) seized computers, blank credit card stock, stacks of fake credit cards, and devices that read and scan credit cards from the home of Robert Muradyan. Muradyan was arrested for identity theft and credit card theft, and has already bailed out of jail. 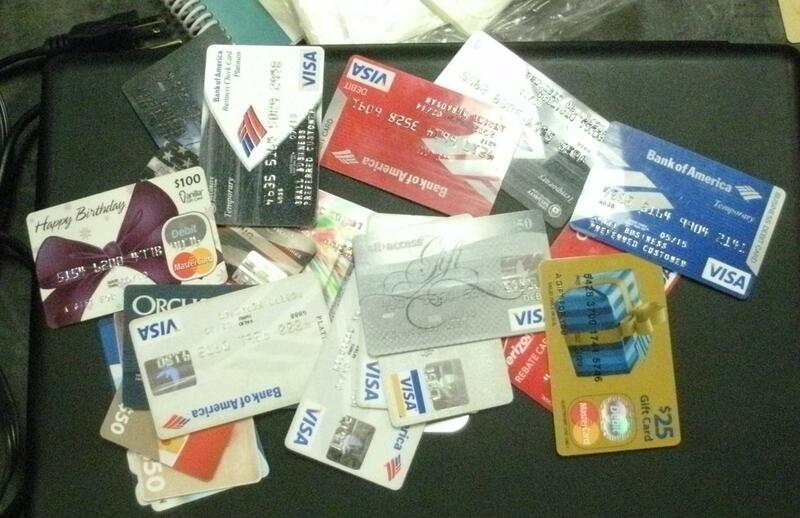 PALMDALE – A 54-year-old Palmdale man, who admitted to stealing thousands of dollars in merchandise through a fake credit card scam, showed no remorse when he was busted Tuesday, authorities said. “He simply said, ‘it’s free money!’ and that’s how he left it,” said Palmdale Sheriff’s Station Lieutenant Cory Kennedy. Robert Muradyan (M/W/54) was arrested around 12 p.m. Tuesday (July 17) after detectives from the Palmdale Station served a search warrant at Muradyan’s home in the 40600 Block of Estoril Court in Palmdale. The search was the culmination of a month-long investigation into a credit card fraud case against Muradyan. 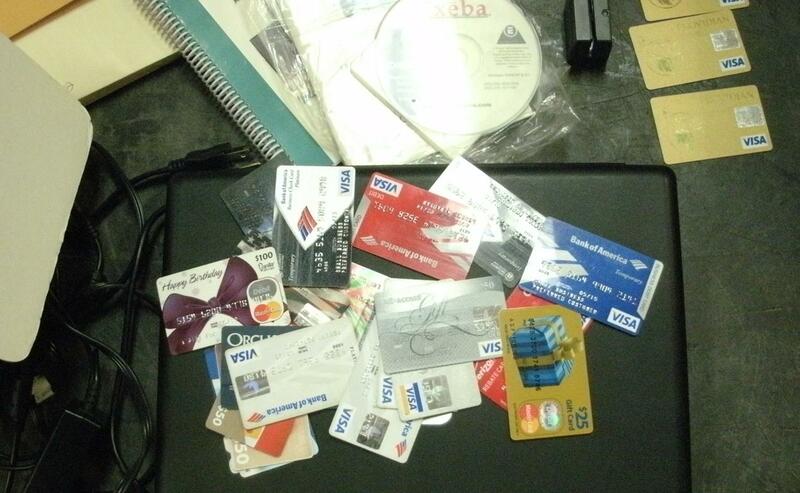 Detectives seized computers, blank credit card stock, stacks of credit cards with Muradyan’s name on them, and devices that read and scan credit cards. Muradyan was using the equipment as part of a credit card fraud scheme, Kennedy said. The cards had Maradyan’s name on them, but the victims’ info. was loaded onto the magnetic strip. Detectives got the break they needed when one of the victims, who lives in Illinois, noticed some unauthorized transactions on her credit card. Kennedy said the victim was able to put a stop to the fraudulent credit card charge in Fontana, so that when Muradyan tried to pick up his order for rims and tires, he was told the credit card had been blocked. “He paid cash, and they were able to get a license plate,” Kennedy said. Palmdale detectives also viewed surveillance video of Muradyan trying to use the fake credit card at Walmart. “This guy is seen at Walmart trying multiple cards until he gets one that bites,” Kennedy said. When confronted with the evidence Tuesday, Muradyan admitted to the crimes and was arrested for identity theft and credit card theft. “I think we’re going to charge him with commercial burglary as well, because he went into Walmart with these bad cards,” Kennedy said. Detectives will be looking through Muradyan’s flash drives and computers to identify other victims scammed as part of the scheme, Kennedy said. Muradyan has already bonded out of jail and is due in court within the next 30 days to answer to charges, Kennedy said. 8 comments for "Busted credit card fraud suspect: “It’s free money!”"
We should all go loot his house. Let’s see how he likes being stolen from. What’s wrong with people, man. He probably stole information from the arresting officer and used it to pay the bail. Hopefully the stolen cards weren’t EBT cards….then we’d be getting ripped off twice!! I have a question… Did he use on of his fake credit cards to bail himself out? Or did he sell his ill-gotten gains and stock up on cash for just this purpose? Either way makes my stomach turn. Wish he wasn’t able to be bailed out, but the law is the law, for one and for all. Earl, thats what I was wondering..about the bail…I am sure they didnt want to let him go either, but, you know these criminals are so protected..and, have so many more rights than others..
Super work Sheriff’s Department!! Having your I.D. and/or credit cards stolen is no fun. Stick it to this POS!